We met Peter Reynolds at the New England Society for Children Book Writers and Illustrators Conference, when he gave one of the best talks we ever heard. Whimsical and serious, passionate and jovial, wise and yet curious, Mister Reynolds was everything you’d want in a wildly successful picture book writer. Plus, he was inspiring. Much like his books. The Dot, which has become a classic, is deceptively simple. Like all great books, it works on many levels. It can be read as a simple romp. It is also a child’s coming-of-age story. On a deeper level it’s about Art, how people become artists, and how the Artist torch is passed from one generation to the next. So we thought we’d sit down with him and have a little chat about kids, writing, art, and life. By the way, if any writer has an interest in writing a book for kids, all the way up to Young and New Adult, you’re crazy not to join the SCBWI, and going to their conferences. They have chapters all over the country. They are awesome. The Book Doctors: How did you get into the business of professionally writing books for kids? Peter Reynolds: I took the Long and Winding Road at the junction of Serendipity and Daydreaming. So many things “set the stage” for me being a writer for children (and grown up children), but I owe a lot to my daughter, Sarah Reynolds whose voracious appetite for stories demanded that I start coming up with stories to supplement what we could fit on her shelves or take from the library. Writing for her reset my creativity compass. You can get lost among the forests, swamps, and thickets of possible plots and characters, but she helped me focus on telling her a story- and instinctively I felt a need to give her something worthy of her intelligence and perhaps a scrap or two of wisdom I had clumsily gathered along the way. TBD: Teachers have played such a big part in your development as an artist (& a human it would seem), why do you think we undervalue teachers so radically & horribly in our society? PR: How long do we have? Seriously, I could go on for days on this subject. I actually think most of us DO value the role of teachers, but we allow politicians and policy makers–who spend little to no time with children in learning environments–to strip away the resources and flexibility for great teachers to “do their thing.” If our government could control restaurants the way they do schools, you’d find Gordon Ramsey working as a fry cook at McDonalds. America takes pride in being independent and innovative. Our public education system-being a system–inherently strives to be efficient and in doing so, chops out all the “messy bits.” It’s this very “fringy” stuff that is required for innovation. Book Doctors, you’ve inspired me to go out and hug the nearest teacher and cheer them on. Actually, the creative teachers DO know how to sneak in the good stuff. That, combined with the fact that technology is getting cheaper and into the hands of kids, is about to transform radically the world of schools as we know them. TBD: How do you go about developing a picture book story? What’s your process, from idea through publication? PR: We should have booked a week long Caribbean cruise. Here’s the nutshell version: My “story radar” goes off, I jot the idea down, and sometimes just one image or even a rough version of what the cover might look like. I roughly storyboard the images and add captions. I share with a few people. I read it out loud. Finesse and tweak. Then I share it with my agent, Holly McGhee at Pippin Properties who is a fabulous editor, thinker and guide. Then it’s on to find the right publisher. Once the book has a “home,” I work with the editor and art director to refine. The sales team gets into the mix when it comes time to confirm or change the title of the book and create the cover. When we’re all happy, it goes off to the printer and the long wait begins before getting that first preview copy. It may be a few months after that before the book shows up on bookshop shelves. That whole process can be squeezed into a year, but most often–from spark to finish–it can be about two years. TBD: You seem to have many projects going on, how do you juggle all of them, running your business, and having a life? PR: I do indeed, but I have great people around me to help get it all done. I have my wonderful team in Boston, FableVision, my bookshop staff at The Blue Bunny, my agents at Pippin Properties, among other great friends and colleagues. Balance though is key. I’ve worked hard in the past few years to get the formula right. Less is more. Less travel, more time with my 3 year old son. I have a new studio called The Sanctuary which, in theory, is my very own thinking and creativity temple, but I do occasionally find my son sprawled out painting mostly on sheets of paper, but also the floor. He actually reminds me of what freedom really looks like. TBD: I’m so jealous that you have a twin. What’s that like? PR: For me, it’s amazing. We both feel blessed. Not sure how you “singletons” do it. The journey is so much easier when you have a twin to share it with. While we are technically “identical” twins, Paul is not a “duplicate” of me. He is the being who is connected to me and able to extend my sensing of the universe (and vice verse.) It’s like two spaceships shooting in opposite directions to explore the universe, but in constant communication and transmitting to the one database back at ground control. Our advice to everyone, if you don’t have a twin- go out there and find one! TBD: So many picture book authors stress the lesson they’re trying to teach kids instead of character & story. Could you address this? PR: I think that is a common trap. That “being on the nose” is a fear that kids won’t “get it.” Kids are mighty smart and they can smell “a lesson” a mile way. Hey, sometimes it’s a place to start, so whatever works for you, but then try to find a more creative way to get the audience to “connect the dots” after they’ve closed the book. TBD: Why do you think there is a prejudice against rhyme in the picture book world? PR: Well, on a practical note, rhyming books make it difficult to translate into the many other languages on the planet. It would be a real doozy to find equivalent words for “kale” and “pail” in Persian. Having said that, I think you can put that on ignore and just make a rhyming story that works. Rhyming books, done well, are a lot of fun to read aloud. My upcoming book collaboration, YOU & ME is a rhyming delight from Susan Verde. Do what makes you happy and the kids around you. TBD: What are the greatest joys & frustrations about writing picture books? PR: It is mostly JOY. I absolutely love sharing my stories with so many people around the world. 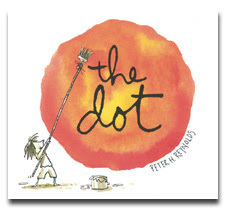 Seeing the “ripples” that just one story can make is a “wow.” International Dot Day is a great example. Over a million teachers and students put down their regular work and tests on Sept 15th to celebrate creativity. The frustration is having to schedule creativity. The publisher might have a deadline for a book due in September which means that I have to be ready to roll and really feel it in January. Trying to find that “surfer’s perfect wave” in the middle of a cold, winter’s day might not happen. Eventually, a wave appears and you ride it in to shore. TBD: How did The Dot become such a great success? PR: The Dot was my way to come to rescue of children (and adults) whose creativity and confidence had been steamrolled. As it turns out, there are plenty of folks facing this challenge. While it often gets labeled as an “art book,” the idea is really about bravery. Bravery is a universal concept. That helps a book find a big audience. TBD: What advice do you have for beginning writers trying to break into the picture book racquet? PR: Start with a real story. A startling memory of your own. A wee bit of advice your Dad shared. A wish you have for yourself – or for the world. Find the idea you know or believe in. One that you’d be very sorry if you lost along the way. Find your network. Could just be your “twin,” or it could be a gaggle of Twitter friends, or the kids at the local library, or an organization like SCBWI . Be brave. Make ONE book where you throw out all the rules, all the advice you have been given, all the notes in all the writing workshops, and create something just for YOU. The most important advice I can give is this: KEEP GOING, NEVER STOP. I’m planning on doing the same. 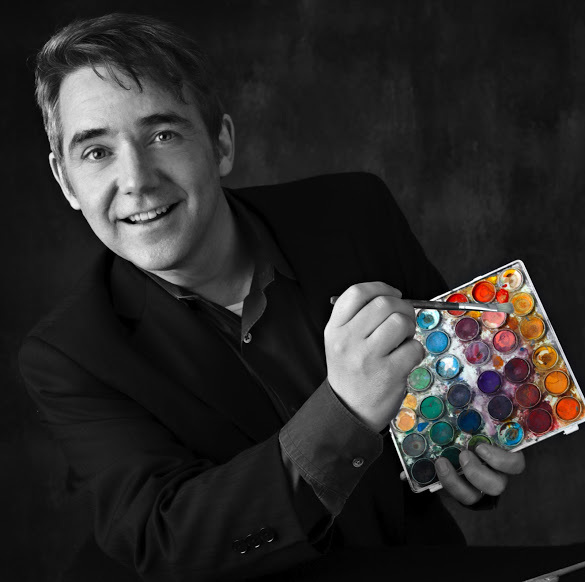 Peter H. Reynolds is the author and illustrator of the Creatrilogy series which includes The Dot, Ish, and Sky Color (Candlewick Press/Walker Books) Other books in his collection include I’m Here (Simon & Schuster), The North Star (Candlewick Press/Walker Books), as well as many collaborative works, which include The Judy Moody series (Candlewick Press/Walker Books) with Meghan McDonald. He is also co-founder of FableVision, a children’s media studio in Boston. His family runs The Blue Bunny Book & Toy Store in his hometown of Dedham, Massachusetts.